DLF, or Droid Life’s Favorites, is a series of articles reviewing our favorite apps in a given category. The goal of these articles isn’t to extensively review every single option out there and determine which is “the best,” but rather to give you a few of our favorite apps in a category. This week we look at Droid Life’s favorite gallery apps. Even though we call the tiny computers in our pockets “phones,” I like to think of them as communications devices. I use my “phone” almost exclusively as a means of communication. Sometimes I use my voice, sometimes text, sometimes I’m receiving messages from others, and a lot of the time I’m taking, viewing, and sending pictures. Below are my favorite apps to view and organize my pictures and videos. It should come as no surprise that my favorite way to view my photos and videos is with Google Photos. Google Photos is more than a gallery, of course, allowing you to upload all of your photographs to the cloud for free at high quality or you can pay to upload everything in full quality and pay for the Google Drive storage you need. It’s a fantastic deal, but that alone would only make it comparable to all the other photo services out there. Google Photos isn’t like everything else, though; Google Photos is magic. I’ve spent hours and hours organizing my photos in Dropbox only to find a month later that even more organization is needed and it’s still difficult to find the picture I really want to see. Google Photos solves all of those problems and more. To try and put it lightly, Google Photos is one of the best products to come to market in the last ten to twenty years. That’s how good it is. 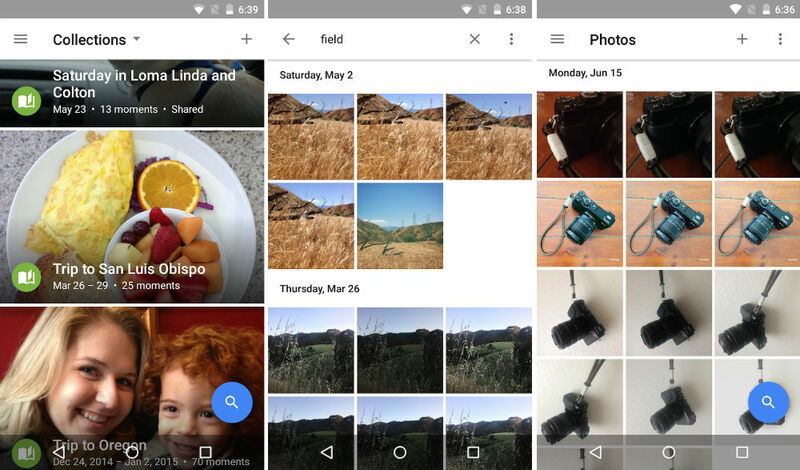 So what makes Google Photos so good for browsing and organizing? In order to browse photos you usually have to decide what you’re looking for specifically and then find it based on how it’s organized. Most people probably organize their photos based around date and then maybe break photos into folders for location or events or months. With Google Photos you don’t have to do any of this. Just tap search and select what you want. Want to find pictures of dogs? Type dog. Pictures of your sister? Tap her picture under the people section. Pictures from your vacation in 2004. Type vacation 2004. It’s that simple and yes, the vast, vast majority of the time it really works. Are you a photographer who shoots in RAW? Google Photos will actually show you those files, something the competition (read Dropbox) doesn’t do on mobile or web. If for some reason you’ve been holding back and haven’t tried Google Photos, stop what you’re doing and start using it. I would still recommend keeping a second copy of everything (either by also using something like Dropbox or remembering to download a copy of everything new every so often if you have lots of free time), but make Google Photos your primary photo solution now. Maybe you like Google Photos and use it, but you want a way to browse and categorize photos on your phone locally for a specific project. Or maybe you just hate the cloud and want to sync your photos locally but still have a nice way to browse and organize photos. If that’s you, take a look at Focus. 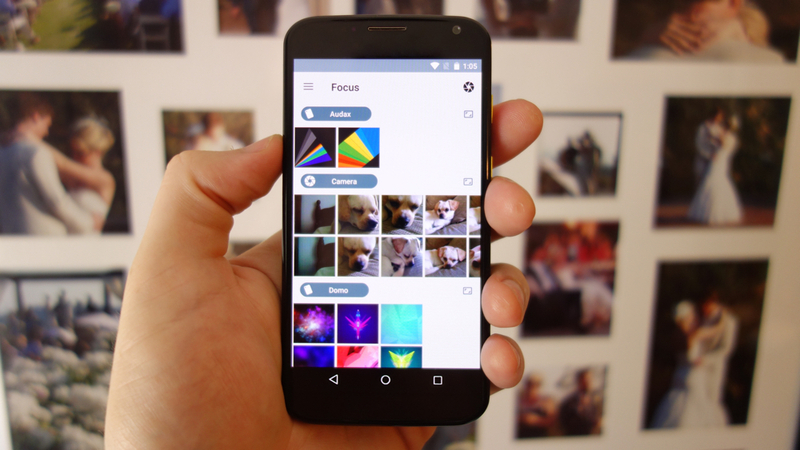 Focus is a brand new gallery app that automatically organizes your photos for you under tags. It defaults to using tags like Camera, Videos, Download, Instagram, etc. but you can add tags like Family, Art, Food, Nature, Travel and more. Focus also allows you to view full EXIF data for photographs. In addition to this, if you unlock the Premium features for $3.79 you can add custom tags to your photos for organization (think Gmail labels for your photos). This is vastly superior to folder organization because you can label a photo with multiple tags. For example, I can label a photo from my brother’s birthday party with “Calvin’s Birthday Party 2014” and “Calvin” and “Cake” and then find that photo with any of those tags. Focus has a few other great Premium features. Focus lets you set a passcode for the app for when you want to show a friend a photo without having to hand over all of your photographs. You can even manage your tags so that the app only shows you the tagged photos, or collections, you want to see. So, for example, if you never want to see screenshots you can remove those from the normal gallery view. Premium also unlocks a night mode and gives you access to future features like Google Photos integration. Focus is free on the Google Play Store. 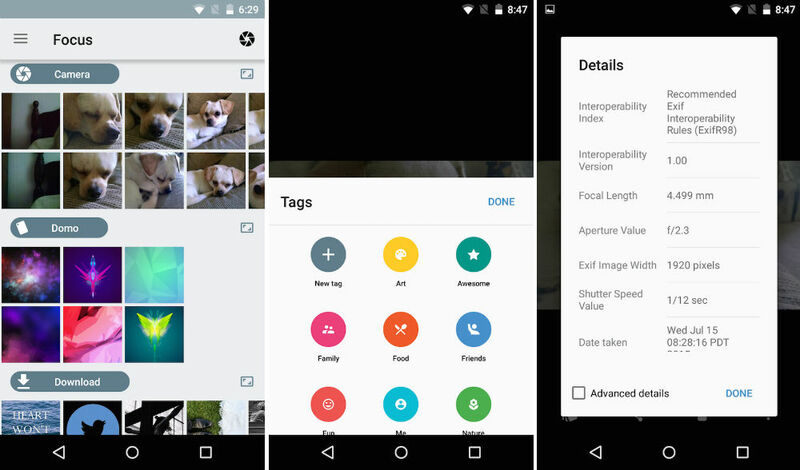 Between Google Photos and Focus you should be able to organize your photos in a breeze. Let us know in the comments how you organize your photos. Giveaway: $300 in Google Play Gift Cards Up for Grabs!